986: Early Riser - Twokinds - 15 Years on the Net! Natani: (Thoughts) …Huh… Guess he isn’t quite as shy when he’s asleep. Natani: (Thoughts) I’m usually the last person to wake up in the morning. Keith must have really exhausted himself this past week. Tch, idiot… getting so worked up over someone like me. Natani: (Thoughts) I guess we’re both a couple of idiots. …And I’m okay with that. Natani: (Thoughts) Is something poking me? 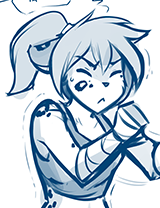 Natani: Alright, nope! Not quite that okay with it yet! Time to get up!